There are countless conservatives in this country who support Medicare and support Veterans Affairs (VA) but are against the Affordable Care Act (Obamacare). They are against the idea of universal health care at the federal level. There is a cognitive dissonance at play here that is rarely discussed during health care debates in the media. We take it at face value that conservatives are against federally controlled universal health care as a matter of principle, but apparently their principles are malleable when it comes to Medicare and Veterans Affairs. Medicare is a single payer health care insurance system for citizens 65 and older as well as younger citizens with disabilities. The government is the single payer and sole insurance provider. The United States Department of Veterans Affairs (VA) is a government-run benefits program for military personnel. The VA is an example of what could be considered ‘socialized medicine’. Government pays the bills and provides the health care services through government-run medical facilities and clinics. If conservatives are in agreement that Medicare and the VA are good things (and most are) then I ask: what’s the problem? 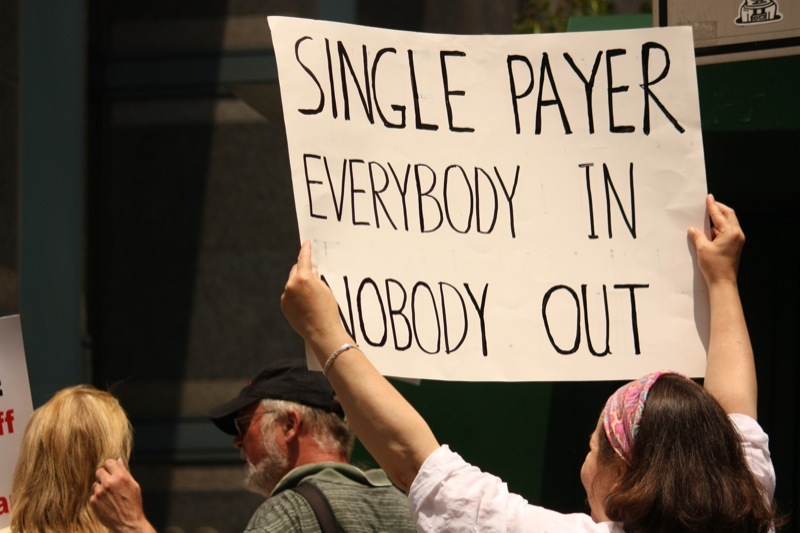 What’s the problem with single payer? What’s the problem with socialized medicine? If this isn’t cognitive dissonance then somebody needs to explain to me where I’ve gone off the rails. The NObama Impulse: If Obama is for it then conservatives are against it. Fear of change and fear of the unknown. Believing the worst in people and thinking that this is a liberal ‘free hand-out’ agenda. None of these positions is defensible. 50 million people are without health care insurance in this country. If conservatives could muster a fraction of the energy devoted to attacking everything that Obama does and channel that into solving this problem we would be a lot further along. People need to get over their fear of change which is deeply rooted in self-preservation and is unproductive when trying to solve a national problem. Believing the worst in people will never make the world a better place. An effort to give all Americans equal access to health care is not a covert liberal agenda to redistribute wealth. Instead, it should be a goal that every American has for this country. This isn’t about left vs. right, it’s about right vs. wrong. We have decided as a country that we will not turn someone away from the emergency room even if they lack the means to pay. Now we need to figure out the best way to pay for health care so that nobody needs to show up at the emergency room without insurance in the first place. We need to figure out the best way to pool all the risk in this country so that people who are healthy are paying into the same system as people who are sick. There will always be people paying for the services others receive, this is how insurance works. The sooner we recognize this as a country the sooner we can have a true universal health care system that offers equal access to all Americans.